I have three different hexagon EPP projects right now so it seemed appropriate/convenient/efficient to share them all together! The first 2 projects are related. This one stems from a desire to purchase more, more, more fabric. I wish I had unlimited funds to order complete sets of the lines I love, but alas I am not a millionaire. So I thought it’d be fun to at least be able to get a bunch of mini charm packs. 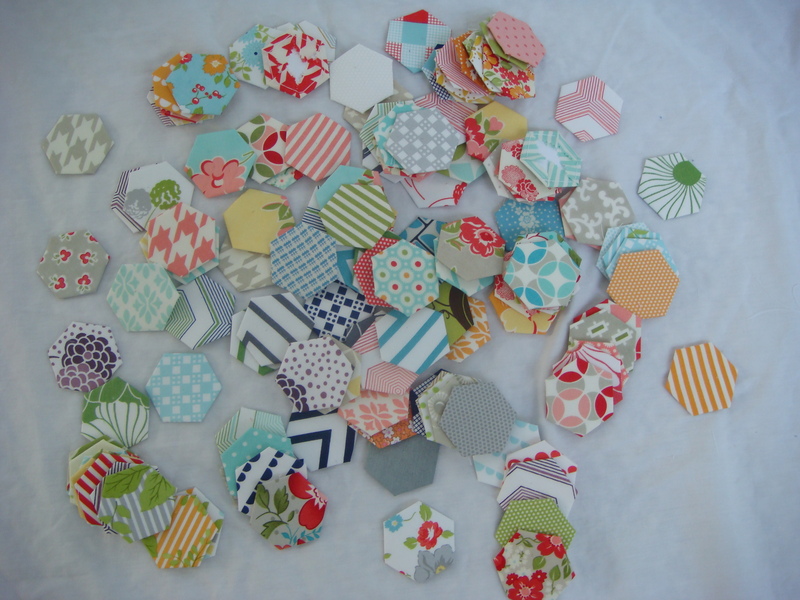 So I bought a huge pack of 1200 one-inch hexies intending to combine mini charm packs with my existing scraps to create an uber-scrappy masterpiece. Hexagons are measured just along one side and 1 inchers are just perfect for 2.5 inch squares. 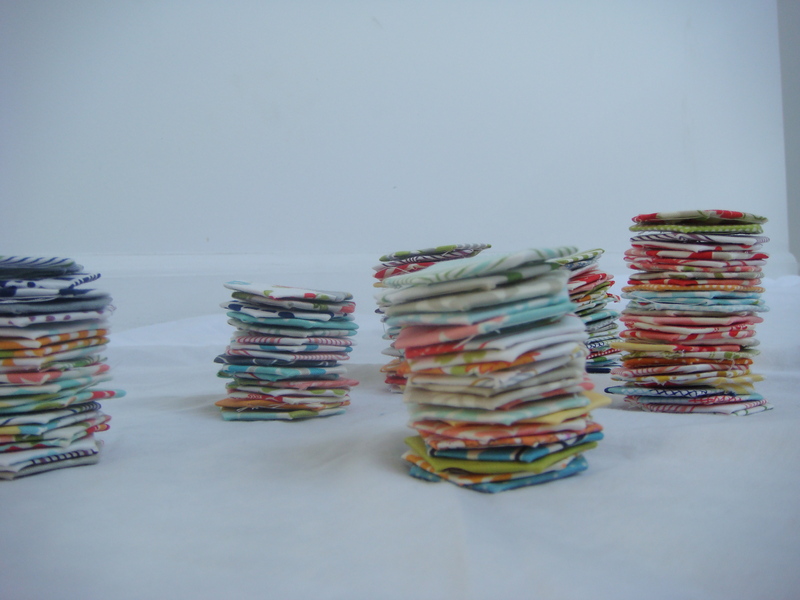 But then… after I got going I became enamored of the way the lower volume pieces looked together. So right now I have the brighter, more saturated pieces separated. 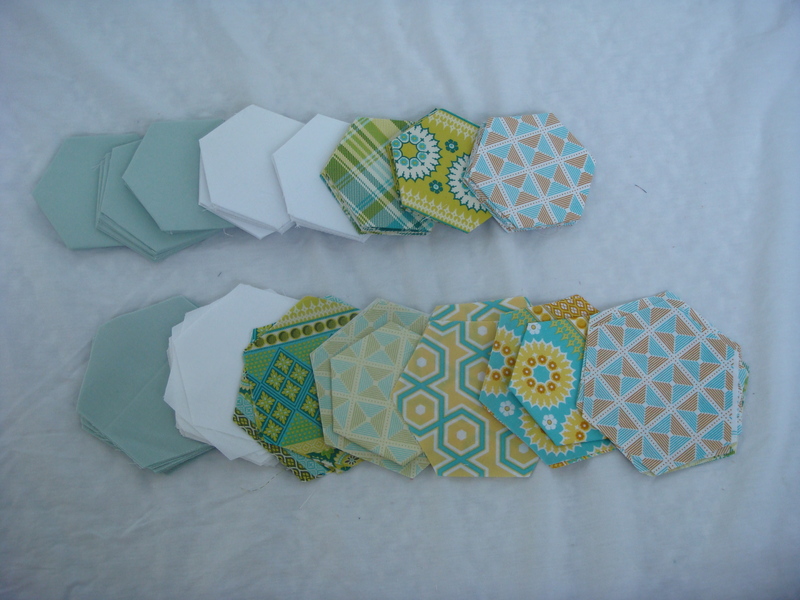 If one scrappy hexagon quilt is good, 2 is better! But we’ll see what I decide in the end. The next one I’m calling Hex Stripes. It was inspired by a deep need to cut into Joel Dewberry’s line Notting Hill. I’m loosely planning to use it in the new guest room we’ll get once our little one is old enough to bunk with his older brother. (But let’s be honest- it’s going to primarily be a sewing room, finally getting me out of the dining room.) These hexagons are bigger- 2.5 inches per side. I discovered EPP via Amy Gibson’s free 2012 block of the month on Craftsy (it’s still available and it’s awesome so check it out). Just realized I have now linked Craftsy in 3/3 blog posts. 🙂 I promise they’re not paying me. Relaxing. For one thing, it is a nice break from machine sewing. It’s great to do in front of the tv at night. I often feel too tired after the kids’ bed time to do proper machine sewing but EPP takes less energy. Portable. I have a little plastic container I can take with me outside when my boys are playing. I can’t wait for the next road trip we take. I will be all set! I think I must hate sitting still. Charming. EPP is so old fashioned. It makes me feel connected to a mythical group of Laura Ingles types from the past. Is that weird? Versatile. Another great feature of EPP is the way it handles shapes that are more difficult for your machine (hexagons & diamonds, for example). It’s also great for appliqué because it creates finished sides. On the other hand, it’s slow people. But I think it’s important to approach EPP projects a little differently. It’s not about efficiency! It’s not the type of project that you start and finish the same month or maybe even year. These 3 projects are long term, especially the mini charm pack ones. I don’t force myself to work on these projects if I don’t feel like it. There’s plenty of time in my life to get these done eventually. In a couple of years it will be so worth it! I do my EPP a little differently- I hide my basting stitches so I can leave them in. I think it’ll be my first tutorial when my WIP posts are caught up! I taught a class to my Mom and her friends and it was great fun. Tune in for another WIP tomorrow: a pair of Christmas quilts! i just got started with epp and it has been so fun! love what you’re doing here and the idea of all the mini charms as a way to get lots of different fabrics. that’s been nice with the epp – it doesn’t take much fabric so you get a taste of lots of them. The other great thing is that you get to test out and see the fabrics in person! I do a lot of online shopping and after working with even 2.5 in squares I have a better idea of which fabrics would be most useful for my stash. I love what you’ve got so far! They look so fun to play with and rearrange! So far I’ve been avoiding EPP, but I’m curious to see your method! Oh you have to try it! Since you knit you already know you’d like the handwork! I hope to do a tutorial next week. My first! i love how your projects all have different color ways happening!! So fun to play in all that color and little hexies are so cute!! Thanks for sharing!! Thanks Gina! I can’t tell you how much this online encouragement helps. I am getting addicted! Love all your projects. Good luck with the blog! Great projects! I totally agree with all your reason for loving EPP, especially the charming part! We’re teaching our kids that the journey is the destination…lol…definitely true of EPP! All three of yours make me smile! Thanks Dee! I love the idea that my projects make you smile that makes ME smile. So true all of your reasons to do EPP. 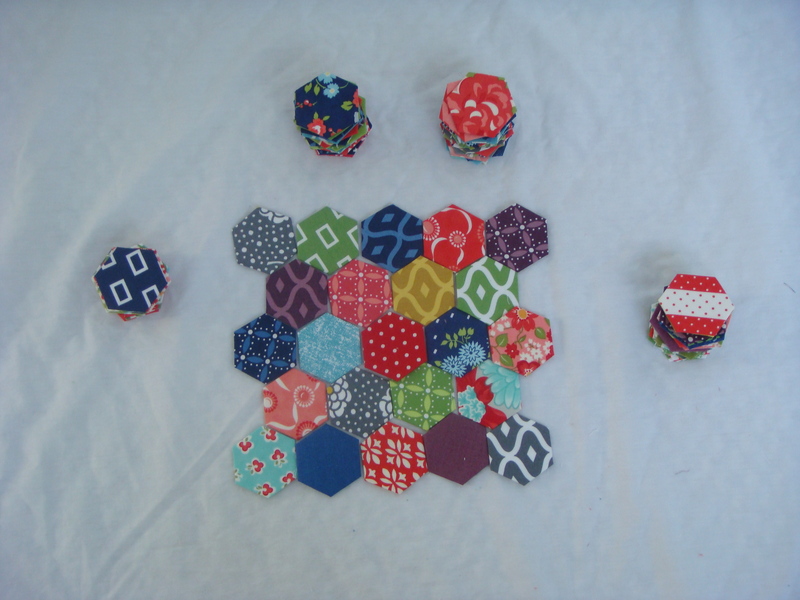 I really love sewing hexagons, and I love all your pretty hexies. Have a nice time with them! You have some good plans and beginnings here. It would be possible to use both the high and low volume together in one quilt which starts at one end with low moving down to high with a graduation/ombre effect. I guess the way will become clear as you keep working. Oh, interesting idea!! 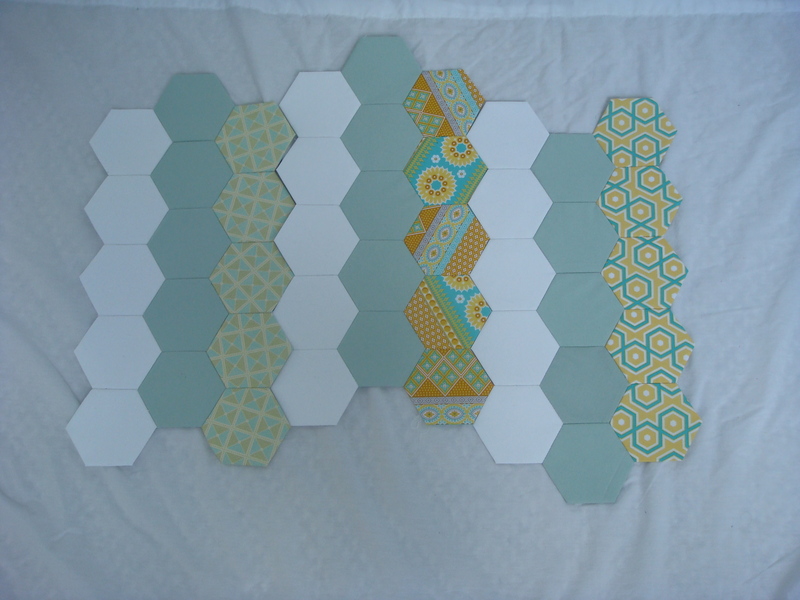 That would keep the pieces together that I think looked so nice but avoid needing 5000 hexies. 🙂 Thanks Karen. I picked up knitting before I tried EPP, and now I feel like EPP will never happen, because I don’t want to give up any precious knitting time! So I will have to live vicariously through the lovely EPP I see on the internet. I like all three of your projects, the brights and the stripes. The thing about hexies is you have plenty of time to make design decisions, because it moves a little slower! Well maybe if you ever tire of knitting you’ll end up coming back to the idea of EPP! Ha! I love your reasons for loving EPP, followed by the absolutely honest truth of its slowpoke pace 😉 One project I want to dive into before EPP is to put together some sort of travel bag/pouch to store projects in (that way I could just throw it in my–enormous–purse and pull it out whenever I have some down time). Have you seen any good ones? Since I’ve yet to do it I’m not quite sure what the essentials are and what will really matter as far as organization goes! Yes, great question! You really just need your papers, fabric pieces (pre-cuts are great but you can DIY your own ahead of time for your bag), pins, needle, thread, scissors… As you can kinda see in my last pic above you can pin a stack assembly-line style and that speeds things up. I’m thinking any bag will do! Have you seen the little travel sewing kits people do? So cute. 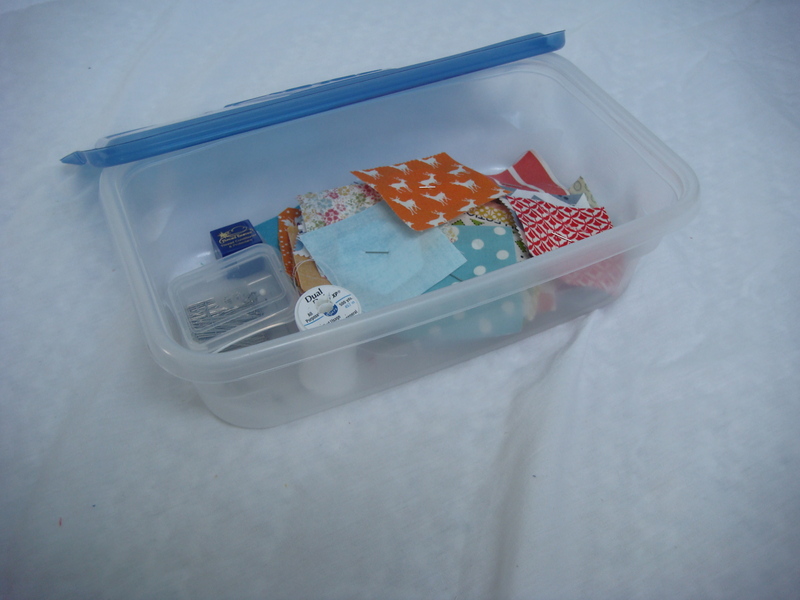 I just typed “travel sewing kit” into Pinterest and there are so many great ones! I promise that is the first post I will do when my WIP posts are done! It’ll be a fun challenge to craft my first tutorial. I just started basting hexies on my family beach trip (don’t really like to read so they were a fun project for sitting and enjoying the family. But I think it’ll be a scrappy hexie project -but I’m not sure ofhow to sew them together. (I know how to thread sew them – but I mean which manner to join them – in rows – I see you have a small block square in your one photo – will you make a bunch of squares and then combine them or will you just continue to work and add rows around the square? I guess this is where i’m now stuck. Most things online they are a grandmothers flower garden so they are pieces as flowers – or I wondered if I just kinda go around a center hexie and keeping working out by a new row around each ring?) I hope my question makes sense. I’d love to start to sew some and change up the pace from basting 🙂 Thanks in advance. I just posted a tutorial but I’m not sure I actually addressed this question completely. Basically you can do it however you want! That’s the cool thing about hand sewing vs. machine sewing. But once you get going you’ll probably want to develop a system that allows you to stop and tie off less often. I sewed mine into rows that would fit into my rubbermaids that I use to store my WIPs. Then I sewed them into groups of 3. Eventually I will join them all. But the bottom line is that you really cannot screw it up. Your question makes me want to edit my tutorial actually, so thanks! Look at it later this morning and it will hopefully answer your question.